That's Another Story: Learning from Picture Books – PIRASAURS! 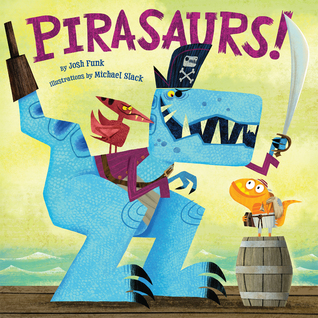 What a great combination -- dinosaurs and pirates. I wish I'd thought of that! This one is bound to be a hit with kids. I will check it out. I finally got to read this during the last book fair. I can see why kids will love it. The illustrations are really terrific. Thanks. What's the cute orange one? What a fun story to read aloud - and I LOVE your treasure map puzzle activity! I too love this story. Josh does it again. Such a fun read aloud. I also love to write in rhyme, Andrea...so thanks for pointing out that it would be a good mentor text for that. I'll definitely try to get a copy. This looks like a very entertaining story. I love the rhyme and illustrations! Yes this certainly looks an entertaining book and kids will love to know what is going on inside. I do love your activity suggestions.